In an earlier post we showed a video of the fieldwork undertaken for the Rocky Mountain Alpine Project in August of 2015. 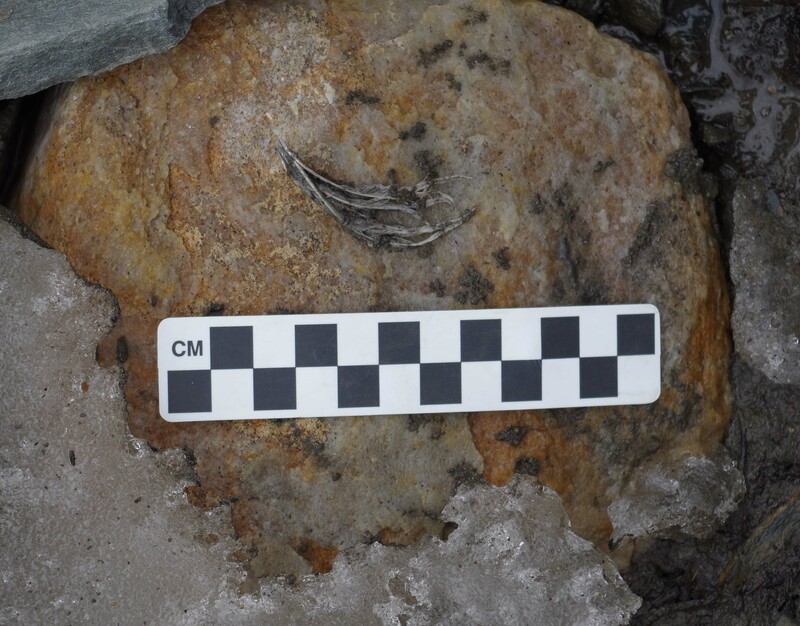 This was a pilot project to determine the potential for finding organic archaeological artifacts in ice patches in the Jasper National Park area. One of our most exciting finds was a leather strip that had recently melted out from the edge of an ice patch. However, we also found and collected a significant number of other naturally occurring organic materials melting out from the ice. While most of these are not archaeological, they are valuable for understanding how this environment and the animals living in it have changed over time. The pilot project revealed that ice patches in Jasper and neighbouring Mount Robson Provincial Park have great potential for archaeological research but also for biological, environmental, and climate research. See below for some of our other finds and their potential to contribute to our knowledge of this landscape’s past. Caribou antlers were the most abundant organic materials found. Antlers can be used to reconstruct caribou populations in the past by recovering DNA from them and using genetics to track population growth and decline. It is important to understand how populations change naturally so that we can interpret what effect human activity might have on caribou. We may also be able to detect the impact of past ecological events (like volcanic eruptions) on caribou populations. Similarily, caribou dung present in the ice patches can also be used to track caribou populations and diet. Some researchers have also used finds like this to track the evolution of viruses. 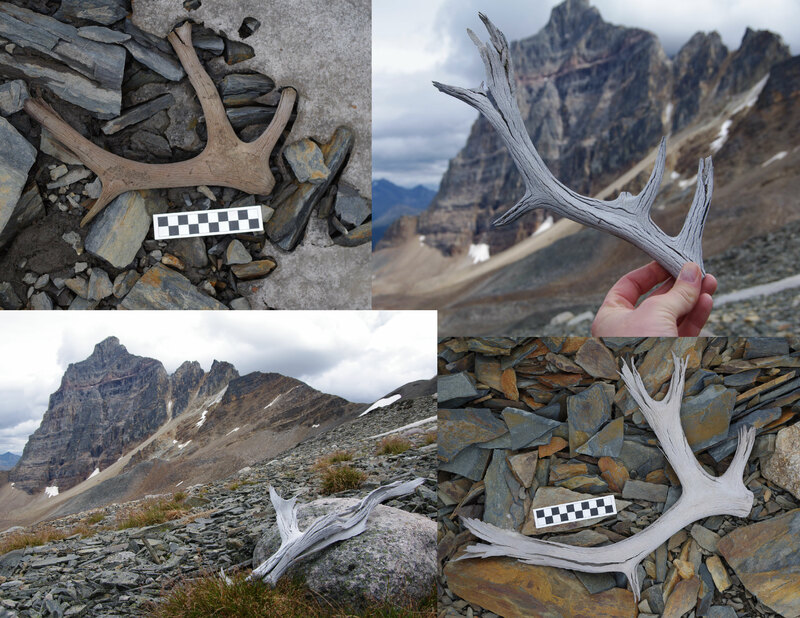 A sample of some of the caribou antlers found at the edge of the ice patches. 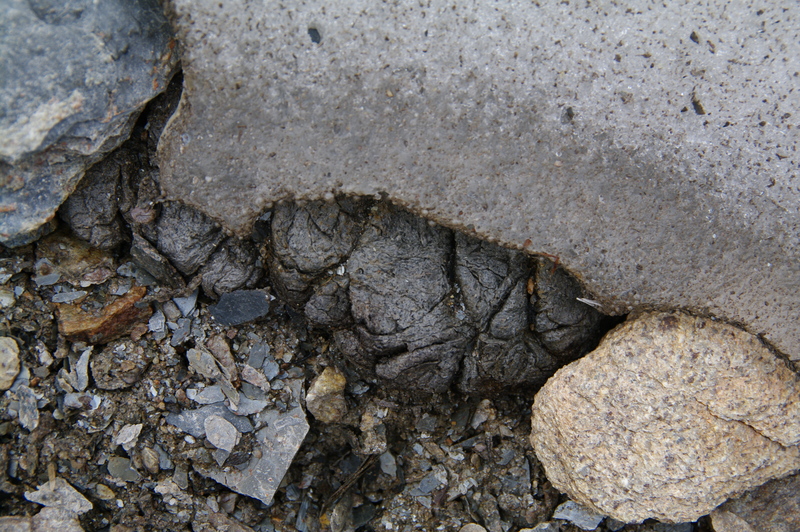 Caribou dung melting out of the ice. Bone is another important archaeological and ecological find. Any bone that was encountered was examined for evidence of human modification such as breaking or fracturing of the bones from hunting and processing. None of the bone we encountered showed evidence of cultural modification but some did have carnivore gnawing on it. 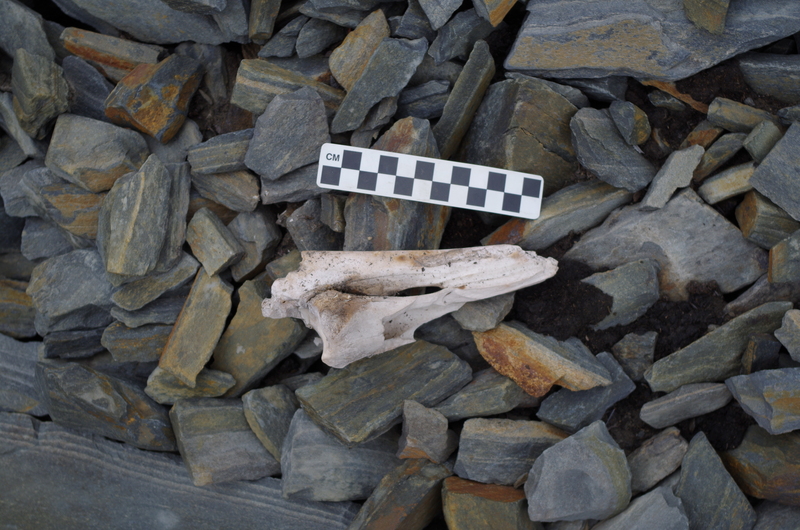 Bones can also be used to track and identify animal populations in the region. An example of bone encountered. Rodents were also found at the ice patch edges. 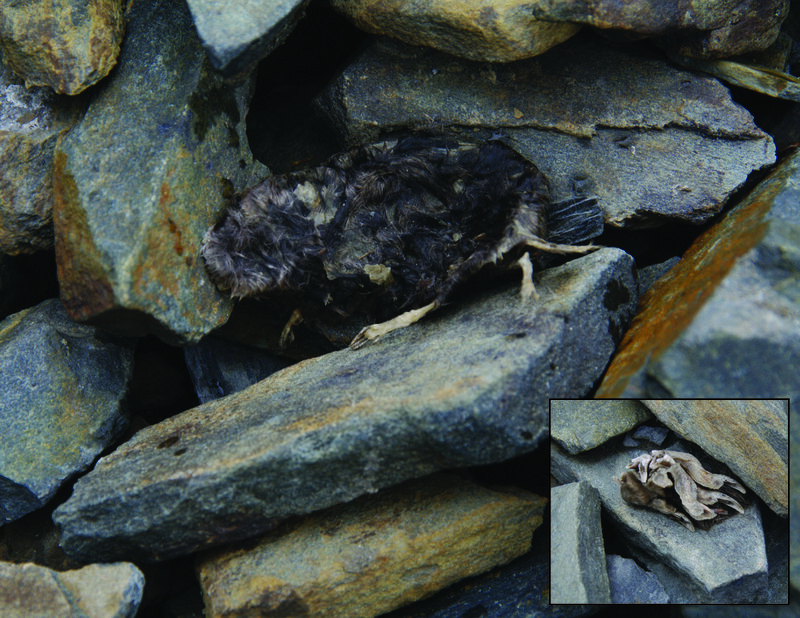 Researchers can use these remains to identify different rodent species present in the area in the past. Depending on their age, some of these may be species that have since gone extinct. This information can also contribute to reconstructions of past environments. A fully preserved rodent and a rodent foot. Wood is another material that we collected. Since we were high up in the alpine (above treeline) any large wood fragments would either have been introduced by ancient people or represent a formerly higher treeline. 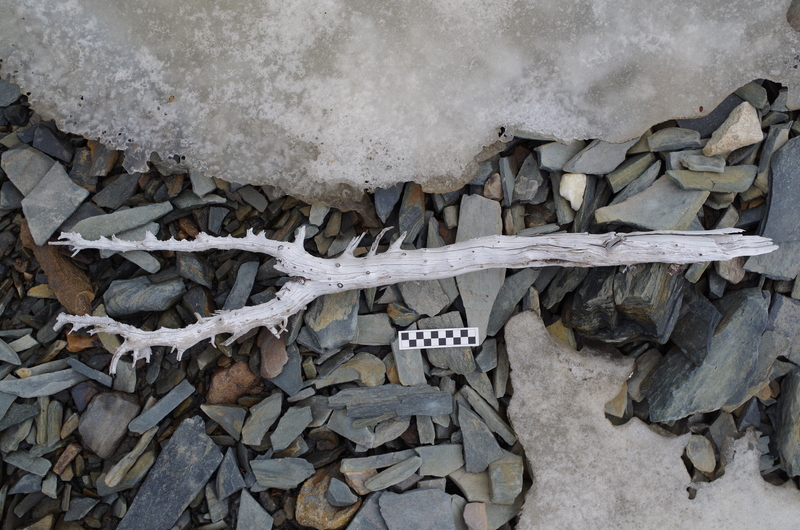 People in the past used wood for spear, dart, and arrow shafts and these could be preserved in the ice if lost during hunting or traveling expeditions. Any pieces of wood that were encountered were inspected for traces of cultural modification. Nothing found this year was cultural but we collected fragments of naturally occurring wood. From an environmental perspective, these preserved pieces can be used to reconstruct changing treelines, which in turn can reveal patterns of past climate change. An example of a piece of naturally occurring wood. Feathers were found melting out of the ice. These can be used to track and identify birds in the region, several species of which actively target ice patches for foraging and heat regulation. Bird parasites can be recovered from frozen feathers, which can help biologists understand the evolution of modern bird parasites. Preserved feather recently melted out of ice. As mentioned above and shown in the video, a strip of leather was found close to the edge of one of the ice patches. The leather is long and narrow with a knot in the middle and on one end. The use of the leather is unknown but it could be from a snare, a bag, or a tie from a moccasin. When the leather was found, we suspected that it was prehistoric in age but the discovery of an old horseshoe and sardine can nearby left us uncertain. To determine the age, a small sample of the leather was sent for radiocarbon dating and proved to be from A.D. 1670 (345 years old)! This dates to just before European arrival in the Rocky Mountains and makes it one of the oldest organic artifacts found in this region. Leather strip found on ice patch edge. Dates to A.D. 1670. 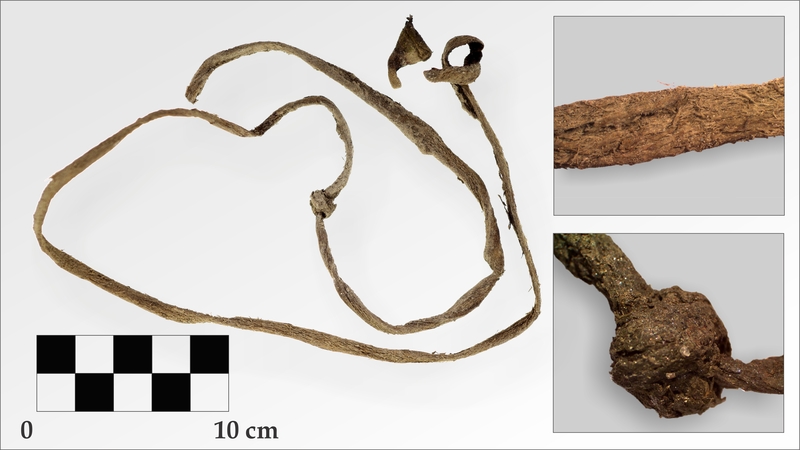 The leather was the only definitive prehistoric archaeological artifact found during the pilot project but several historic artifacts were observed (horseshoe, sardine can, board with nails) and a number of features were encountered. 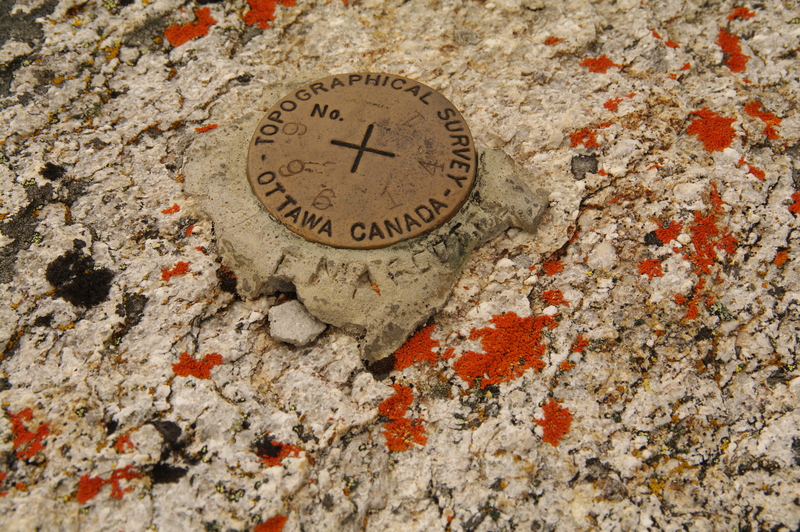 The features include a provincial boundary cairn, a federal topographical survey marker and a stone wall feature. 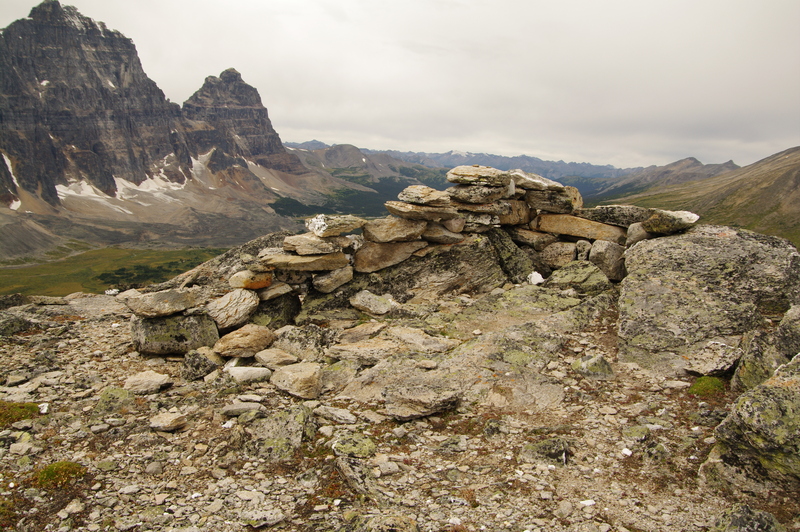 These features were all observed on Tonquin Hill near Amethyst Lake. The provincial boundary cairn and the survey marker are significant in local history. Both are interesting considering the need to transport heavy supplies for their construction at the top of a mountain with steep and difficult terrain. The federal survey marker has a name carved into the cement surrounding it, “F. Marcott”. A stone feature, at the very highest point of Tonquin Hill, and in the same location as the federal survey marker, is a wall built up from flat stones. The age of this feature is currently unknown. 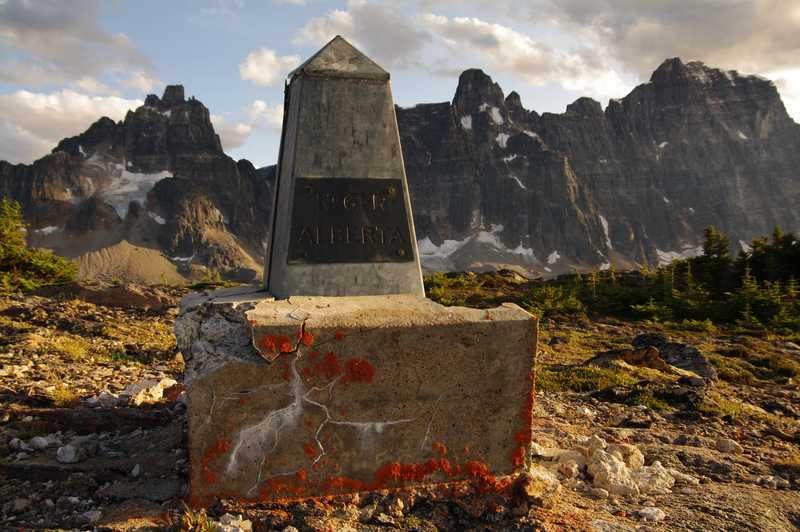 Vision quest sites are sometimes encountered in high alpine areas in Alberta. These types of sites are ceremonial in nature and represent a spiritual quest or rite-of-passage in First Nations cultures. They are often stones stacked in semi-circular or other patterns in a prominent spot on the landscape. The stone feature we encountered may represent a vision quest site but it was more likely built by hikers in more recent times. More research is needed to determine the age of this stone feature. Provincial boundary cairn marking border between Alberta and British Columbia. Federal topographical survey marker, note the name carved on the side – “F. Marcott”. Stone feature on top of Tonquin Hill, age unknown. The Rocky Mountain Alpine Project offers a lot of potential for learning more about Alberta’s alpine landscapes and their use. Clues to understanding how this environment has changed and how it has been used through time are preserved in ice patches. However, these ice patches are melting quickly and some have completely disappeared in recent years. Once these organic materials are freed from the ice they will decay rapidly so it is important to find them before it is too late. We hope to return to the Rockies next summer to continue to contribute to this important biological, environmental, and archaeological record.